This week was a very interesting week in the league. We had 2 weather delays in one afternoon, we had a quarterback who decided to help people win their fantasy league in the first 30 minutes of the game, an older brother who showed why he is completely dominant over the little brother, and 2 absolutely garbage teams with one team having their local affiliate apologizing for showing them and yes………………………….the ever-present word “Tebow” came back into the lexicon of the NFL landscape. 5) Aaron Rodgers is still a force to be reckon with in the NFC. 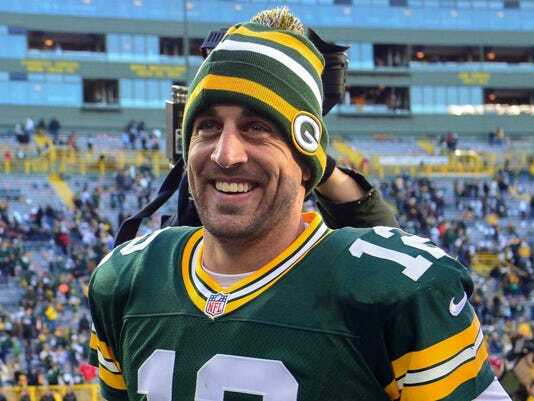 Green Bay Packers QB Aaron Rodgers had a big day against the Washington Redskins. Green Bay Packers QB Aaron Rodgers absolutely torched the Washington Redskins (or what is some assemblance of the Redskins) for over 400 yards and 4 TDs in a 38-20 blowout of Washington. While many people have been ready to put the crown on Colin Kaepernick and Matt Ryan has the top NFC quarterbacks this season, Rodgers has quietly been working to put together a strong season yet again, and even without having Donald Driver and Greg Jennings, Rodgers is still putting up numbers and making stars out of his receivers, similar to how Peyton Manning and Tom Brady did in the early-to-mid 2000s. Now that Rodgers has a running game with Eddie Lacy, the sky is the limit, but also under the radar for this former SuperBowl MVP…….just how he likes it. 4) The Jacksonville Jaguars Either Need Tim Tebow or Johnny Manziel……..or both….soon. 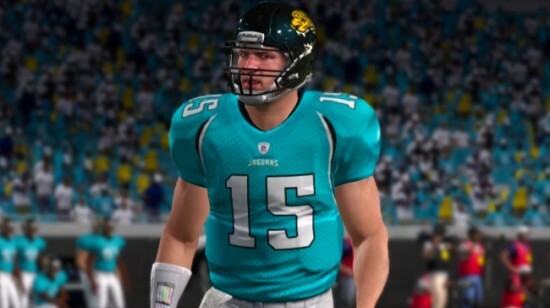 The Jacksonville Jaguars have become so desperate that they will settle for a virtual Tim Tebow. The poor fans in the north and central Florida areas had to endure the terrible game between the Jacksonville Jaguars and the Oakland Raiders, a fate that no NFL fans around the country should have to deal with on any level. At all. The game was so terribly bad that the Orlando CBS affiliate actually wrote an apology on the screen to the viewers that were upset that the network wasn’t showing the “Manning Bowl III” game between Peyton Manning’s Denver Broncos and Eli Manning’s New York Giants, which was the premiere 4:25 p.m. game on Sunday. The only thing that could help out Jaguars fans right now would be bringing in local hero Tim Tebow and, if nothing else, just generate some kind of excitement and spark for the organization. I do believe that the Jags will end up moving to Los Angeles or London at some point, but until then, Tebow would bring some excitement and quite possibly, a few victories. He can’t be any worse than Blaine Gabbert and Chad Henne. If it gets too much worse, Ill be ready to see Denard Robinson reprise his quarterback/really a running back/moonlights as a wide receiver role. If the Jaguars don’t want to bring in Tebow, then the next best idea could be to get ready to draft Texas A&M quarterback Johnny Manziel with the top pick in next year’s draft. Manziel, like Tebow, would bring instant excitement to the field and put more people in the seats if, for no other reason, the excitement and wow factor and reckless style that Manziel tends to exhibit from time to time on the field. No matter what happens, the Jags need a spark. Now. 3) The weather this season could be a sign of what the SuperBowl could be like for the NFL. So far, in only 2 weeks of the regular season, we have had 3 weather delays due to lighting. While the weather hasn’t damped fans’ spirits in all cases, it makes you wonder if this is a precursor to what SuperBowl 48 is going to be like in New York this February. head for a non-snowy SuperBowl this February in New York/New Jersey. This Superbowl will be the first northern-based, outdoor Superbowl ever, and for those who aren’t used to this part of the country, its typically around the 20-30 degree mark (even lower at night) and for those who will be sitting in the stadium at that time, it will be massively freezing and could cause very inclement weather conditions for players, crew and entertainment, which I can’t see how it wouldn’t put a damper on the biggest sporting event in the world. Hopefully this will be the first and last time the Superbowl will be in the cold weather outdoors and we don’t have any major weather conditions this season that alter the play and performance of NFL teams. 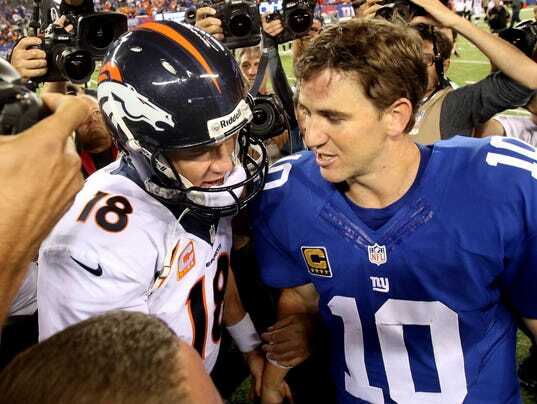 2) Peyton Manning is far more dominant than his brother Eli – in the regular season. In the game that was the top afternoon game on Sunday, in the media-coined “Manning Bowl III” Peyton Manning led the Broncos to a victory over Eli Manning and the New York Giants. It was clear from the second quarter through the end of the game that the Broncos were the far superior team, showing a strong sense of the running game and the most dominant passing game in the league so far this season. The Giants will be fine, but the turnovers are mainly because of the fact that Eli doesn’t have a big running game to help out and he is having to force a lot of plays, on top of the fact that the receivers are not in sync all the time on the field. At that dinner table, yes, Peyton can say that he has won all of the head-to-head matchups, but Eli can flash one more piece of bling than Manning can. Advantage – little brother. 1) The Seahawks could roll into the SuperBowl if they have home-field throughout. On Sunday Night, after an aforementioned lighting delay, the Seattle Seahawks absolutely manhandled the defending NFC Champion and division rival San Francisco 49ers, showing that the 12th man crowd is strong and intimidating when that stadium hits world record noise levels. be a huge key to the team getting to the SuperBowl. With the Seahawks already having one of the more elite defenses in the NFL this season, if the team can get a bit more consistent on offense, if the Seahawks grab a #1 seed in the NFC, it will be a tall task for a team to go into that stadium and beat them in a one-game situation. The Seahawks proved that they were elite on Sunday Night….at least for now. Those are my top 5 NFL lessons for this week. See you all next time!